The World Anti-Doping Agency (Wada) has accused the International Cycling Union (UCI) of being "deceitful" for claiming both would be working together on a truth and reconciliation process (TRC). The UCI plans to replace its own doping inquiry into the Lance Armstrong scandal with the TRC. But Wada denies claims by the UCI that it supports the new commission and branded the UCI as "arrogant". In turn, the UCI accused Wada of "blatant and aggressive untruths". The abandoned doping inquiry, led by a three-person panel that included Paralympic champion Baroness Tanni Grey-Thompson, had been established in response to a damning report from the United States Anti-Doping Agency (Usada) into a decade of cheating by Armstrong and his US Postal Service Team. Usada's report, published in October, resulted in the American being stripped of his seven Tour de France titles and also seriously called into question the UCI's actions over the period. Wada and Usada had previously said they would not co-operate with the UCI's inquiry, which had led the UCI to conclude that any report would be dismissed as "not being complete or credible". "On the day a much-delayed court case into a huge doping conspiracy in Spain finally started, and a separate investigation continued in Belgium, news that cycling's official response to the Lance Armstrong scandal is over before it has even started, really could not be much more embarrassing. 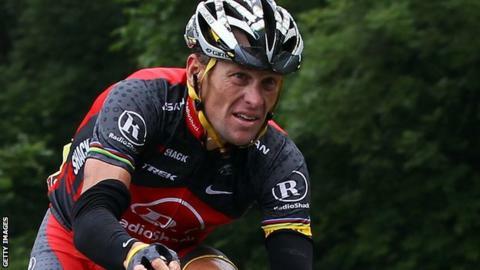 "The official reason for cycling's governing body effectively sacking its own independent commission into the Armstrong affair is that the US and World Anti-Doping Agencies withdrew their support, saying they had no confidence in its ability to uncover the truth. A more cynical view might be that British Paralympic legend Tanni Grey-Thompson and her two colleagues on the panel were simply more independent than the International Cycling Union (UCI) had bargained for. "The UCI says it will now proceed with a full 'Truth & Reconciliation' process - amnesties for riders in return for evidence - which is what many of its critics want, although they will have a long wait for answers. Where this will leave the sport's already battered reputation is anybody's guess." But UCI chief Pat McQuaid said the new TRC had the full support of Wada president John Fahey - a statement Wada was quick to discredit. "This is not only wrong in content and process, but again deceitful," Wada said. "Wada has not and will not consider partaking in any venture with UCI while this unilateral and arrogant attitude continues." McQuaid issued an angry response to the Wada statement, which he called "blatant and aggressive misrepresentations". He also released private e-mail exchanges with the agency and urged Fahey to set aside his apparent "personal vendetta and crusade against cycling" and support the TRC. "Our aims are the same - to rid cycling and indeed all sports of the scourge of doping," McQuaid said. McQuaid added that the original commission had been disbanded following talks with Wada president John Fahey. But Fahey said: "The UCI has decided to terminate its own commission on the grounds that others refuse to participate, and not for any reason that the commission was precluded from operating transparently and without fear. "Wada was not part of the decision to establish such a commission, it was not even consulted. When asked to participate, Wada was at pains to point out the inadequacies of the terms of reference and the timelines. "The commission's lawyers agreed to point those out in order to remedy them. These were not addressed by UCI or the commission so Wada declined to participate." The independent commission was adjourned last week until 31 January, with Baroness Grey-Thompson telling UCI counsel Ian Mill: "It amazes me that we've had no documents whatsoever." On Tuesday, she called on the UCI to disclose evidence. "It was evident early on that the lack of cooperation that the independent commission experienced from key stakeholders would make significant progress difficult and that a wider amnesty was necessary to give cycling a genuine chance for change," she said. "Having urged the UCI to engage in truth and reconciliation, I am glad that it now publicly acknowledges the need for such action. "However, I do not believe the creation of a truth and reconciliation process in itself answers the concerns that have been raised. "I also maintain that is essential that the final process addresses the accusations against the UCI that the independent commission was first appointed to investigate, and which have now been placed indefinitely on hold. "Confidence in the integrity of the UCI is vital for the sport of cycling. It is essential that they make full disclosure of all documentation and evidence to allow the sport to move on and regain its standing and reputation." After announcing its decision to shut down the independent commission, the UCI said the TRC process would launch later this year - and that its report would be published in full. The UCI had agreed to provide an amnesty for those giving evidence to the independent commission. Last week, British cycling coach Sir David Brailsford questioned the need for a truth and reconciliation process, saying: "Already I think there is a wealth of information that you can actually start taking action on and putting tangible things in place."